Dragonfly Head Arresting Mechanism detached and attached. This appendix is concerned with plant and insect attachment mechanisms and their testing. Papers by Gorb et al describe the testing and assessment of plant hooks from five species and the development of a study/design procedure for miniature attachment devices. There is an assessment of the attachment mechanisms in nature and their insertion into the design space for engineered hooks and thereafter papers on insect tarsal/plant surface interactions. This appendix contains the detailed description of eight papers, all of direct relevance to the work in the main body of the report. Sections ‎2 to ‎6 contain a review of papers from S N Gorb et al concerning the study of hooked and parabolic fasteners and the development of and design methodology for biological fasteners. Section ‎7 contains reference to a paper by Vincent and Mann, an overview of the concept of transferring biological information to the engineering sphere including specifically the design space of attachment mechanisms. Sections ‎8‎ and 9 describe studies of insect tarsi performance and insect tarsi/surface interaction and their parameters. It is principally those problems that engineering has yet to overcome for which biologically inspired solutions are of the greatest interest to engineers. In engineering today manufacturing and design challenges are miniaturization and MEMS. Since so many biological systems function at a molecular level and many biological structures are of a size that is impossible for mankind, as yet, to manufacture, this area provokes a lot of interest. The paper by Vincent and Mann includes reference to TRIZ, a Russian design algorithm/patent database that provides a framework for systematically mapping all solutions to a centre of design knowledge. It also is an indicator for invention optimization, the second opportunity for generalized biologically inspired solutions to provide inspirations. The fruit of four plant species (Agrimonia eupatoria, Circaea lutetiana, Galium aparine and Geum urbanum), all of which support burrs as a structure for interlocking attachment to animals (a property termed Zoochory), were studied and the separation forces of each type of burr was measured and compared. The dispersal by animal fur and feathers is known as epizoochory. These detachment values were then related to physical dimensions that could be compared in the structure of the burrs. 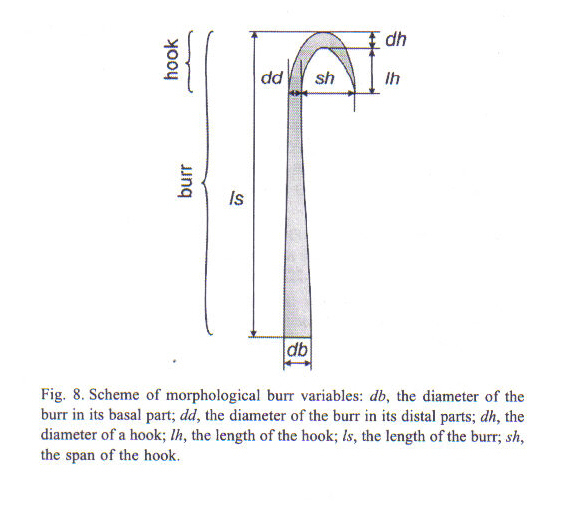 In other words, morphological variance of the burrs was examined and estimated (burr length and burr diameter at the basal part, see Figure 1) and the dependence of the force on the size and morphology of the burrs was examined for each species and then compared between species. The number of burrs to hold the fruit in place was counted and compared as well. Does the contact separation force differ between the species studied? 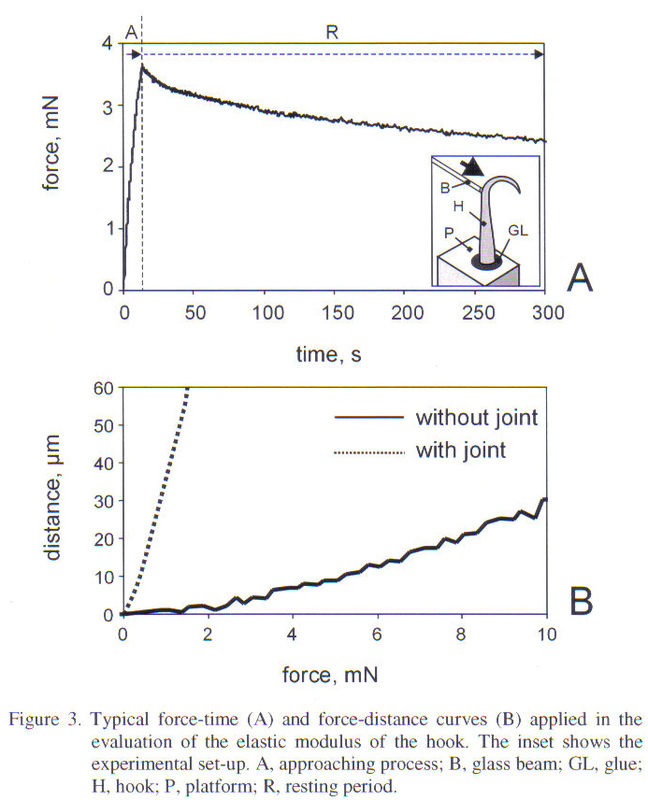 Which morphological variables of the burrs influence this force? Are there some scale effects on the number of burrs per fruit, the force of the single burr and the total force of all burrs? Figure 2 above shows the fine detail of the surfaces of each burr as has been described in the text for each of the burr species. Such close examination is necessary in order to note microscopic structures that might supply additional anchorage to the burr. With reference to Figure 3, the top graph is the separation force of a single burr relative to fruit weight. The second graph shows the interrelationship between the minimal number of burrs to hold the fruit in place, the separation force of a single burr and the fruit weight. The final graph shows the summation of the force of all the burrs covering the fruit versus the fruit weight. 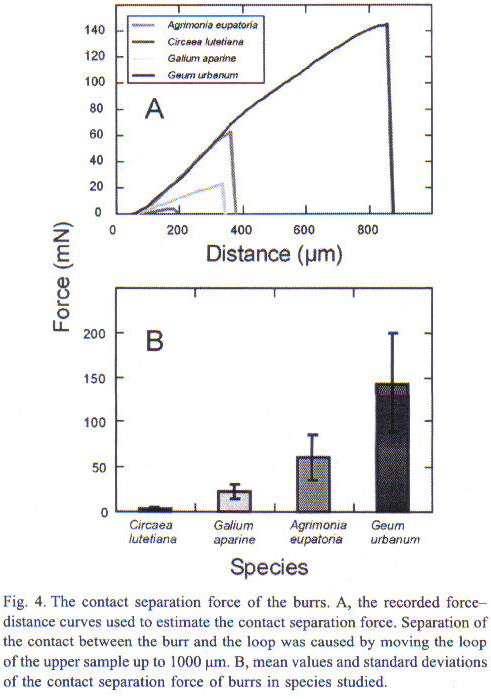 Figure 4 below shows the contact separation force for each of the species of burrs. Figure 4 above shows the actual distance moved by the lower test platform. This test was copied in the laboratory (see experiment 3 in the main body of this report) using an Instron tensile testing machine. The second shows the mean values and standard deviations of the contact separation force values. Consideration of Figure 5 would seem to show that tests A, B and C all were conducted using hooks in situ on the supporting fruit. In D this is not so clear. 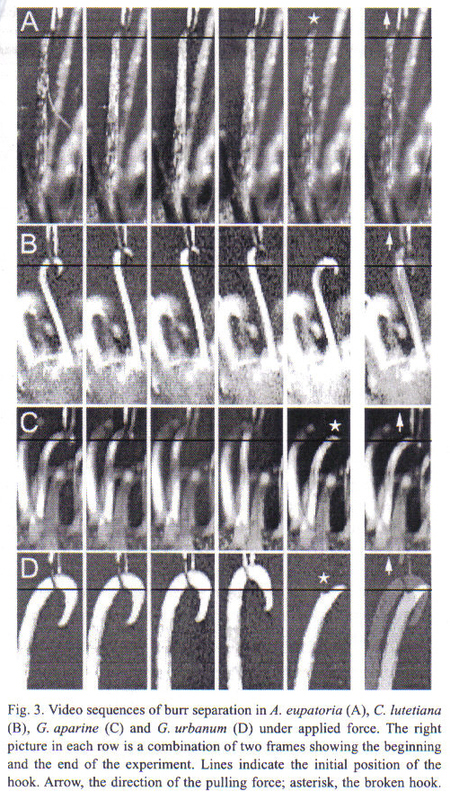 Figure 5 above shows hooks from each of the four types of plant being tested. Note the loop of the micro-force tester beneath each of the hooks (as per the schematic diagram in Figure 6 below) and the horizontal dark lines on each if the images that indicates the level of the hook at commencement of the test. 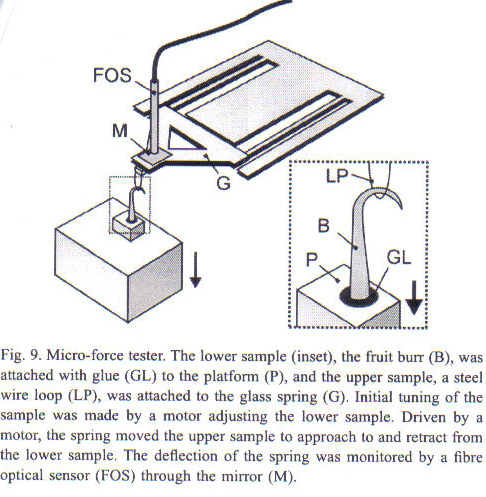 In Figure 6 the components of the micro-force tester are an upper platform (P) to which the sample is glued, a steel wire loop (LP), a glass spring (G). FOS is a fibre optic sensor that detects deflections in the spring via the mirror (M). The force tester was a Tetra Gmbh manufactured by Ilmenau, Germany. In the data analysis, the Kruskal-Wallis test of one-way ANOVA on ranks was used followed by Dunn’s method of pairwise multiple comparison between series (SigmaStat 2.0 for Windows)[‎3]. To calculate dependence between different morphological burr variables measured, linear and exponential regressions were applied. The ANOVA statistic (F) was estimated for the regressions. The F-test statistic gauges the contribution of the independent variable in predicting the dependent variable. It is the ratio between the regression variation from the dependent variable mean and the residual variation about the regression line. The P-value is the probability of being wrong in concluding that there is an association between the dependent and independent variables. The smaller the P-value, the greater the probability that there is an association between the dependent and independent variables. It was concluded in this paper that P<0.05 could be used to predict the dependent variable from the independent variable. The paper concludes with asserting that the separation force depends primarily on the span of the diameter of the hook. These are papers have not been read by the author as of yet are on order. “Plant dispersal by Hares (Lepus capensis) in Kenya”, Ecology 58 (1977) 681-686. This is a study of the jointed hook of Galium aparine, this form of jointed hook not being found elsewhere in nature. The hook is described to exist in two parts, a hooked cone and joint-like base. The joint is actually a zone of “hollowness” at the base which allows the hook to flex. Force testing is carried out using a micro-force tester and, using a mathematical model describing hook geometry, it is found that hooks with and without a base had different elastic moduli. Further experimentation showed that hooks with joints are better able to adapt to forces in different directions, in other words the bent more easily and resisted damage due to the hinge at the base of the shaft. Semi-thin sections were embedded in resin and stained with safranin and fast green, showing that the hook walls contain cellulose and lignin. Artificial hooks (N3 Original Velcro Hook-Band and Velcro Fastening Systems) were tested for comparison. They are described as being “rather large, solid and lacking joints”. The fruit and hooks are briefly described in the paper, but in detail. A combination of light and scanning electron microscopy was used. There is detailed description of the methods of fixing the specimens for examination. A 3-D model was obtained of the fruit using digital images of longitudinal and cross sections. Wall thickness was measured by cross-sectioning at different levels and using light microscopy to digitize the images. The previous paper was used to supply the data for contact separation forces (see Figure 7 below). 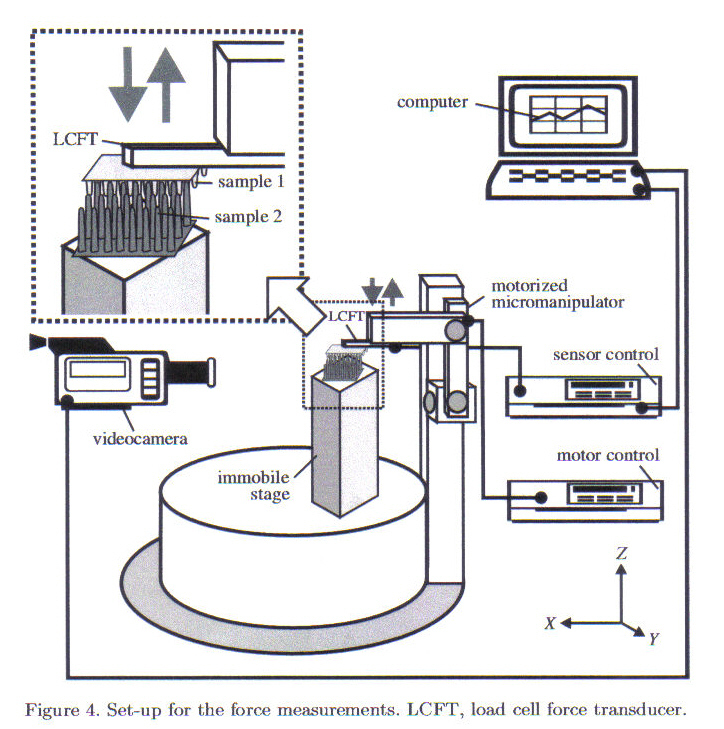 The same force tester used in the previous paper was used here. There is a description of how to derive the material properties using the same force tester. This consisted of applying a transverse force slowly to the specimen, in the region where the specimen begins to curve to form the hook (see Figure 11). The shaft is deflected by the transverse loading. The loading head is then halted and held in place. Over time the loading on the shaft decreases indicating the material exhibits visco-elastic properties because the elastic force relaxed over time. The elastic modulus was calculated during the approaching process by modeling the hook as a tapered shaft and measuring the displacement with reference to the applied force to yield E for the material (see ‎3.6). “…joints provide a higher chance of initial interlocking of fruits. Even if only the apical part of the hook is attached, an initial interaction force may lead to proper interlocking.” Further, this joint effect is simulated in nature by hooks not found on the side of the fruit facing the contact surface because the flexible base allows other hooks to become engaged and contribute to the attachment. It is stated that this joint effect is unknown in industrial hook-and-loop fasteners. 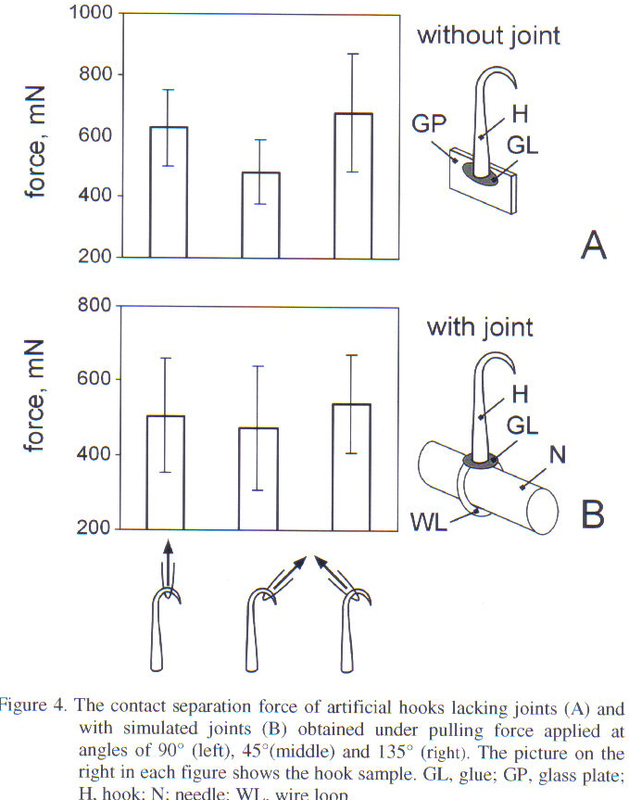 It does not suggest an explanation for the reduction in contact separation force for the artificially jointed hooks compared to those that had been glued to the test support. 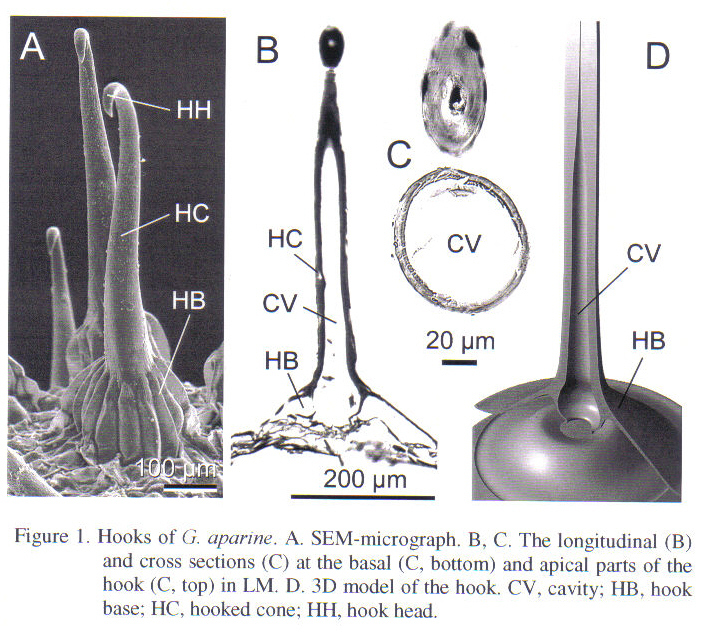 Figure 10 shows an SEM, a drawing and the product of the sectioning of the hook, digitized and reproduced in a computer graphics package. 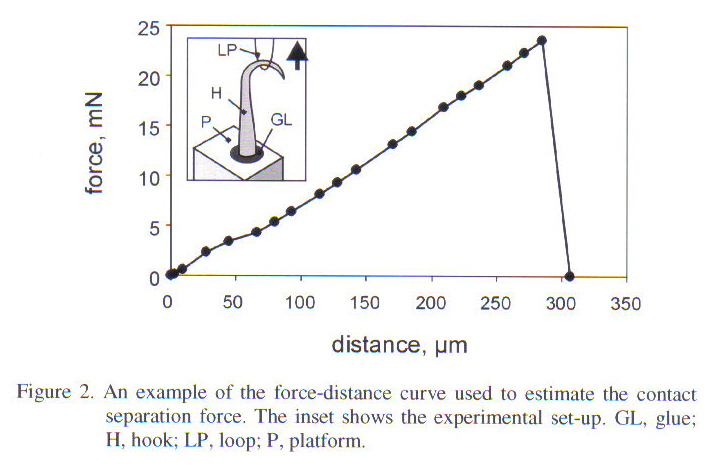 Figure 11 shows the equation derivation for the hook displacement as a function of the applied force, from which Young’s modulus is calculated from the experiments illustrated in Figure 9. The bending moment equation is applied considering the shaft of the hook to be a cone with walls inclined at a constant angle q to the vertical with wall thickness h, shaft length L, deflection y measured and force F being the applied transverse force (see Equation 7 in Figure 11 – The calculation of the displacement of a hook at the point of the force application as a function of the applied force (F) from Gorb et al [‎2]). As in the previous paper Kruskal-Wallis one-way ANOVA on ranks was used with P<0.001 and Dunn’s Method of pairwise multiple comparison (see [‎3]. 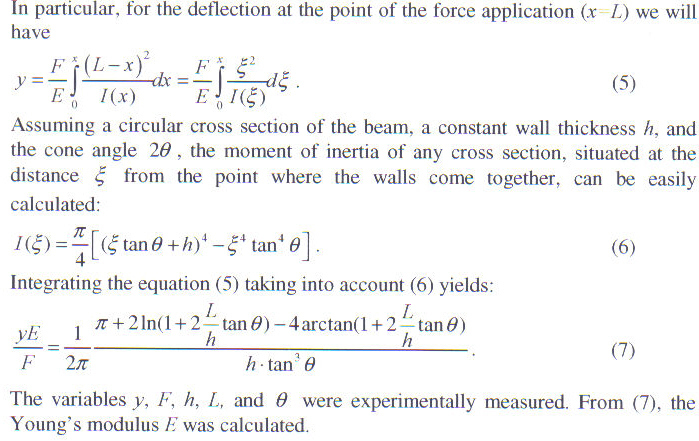 where y is the transversal deflection of the beam at the point x. These papers have not been read by the author as of yet and some of them are on order. This paper does not contain any experimental work. It is a descriptive summation of previous work and much of it appears in Gorb’s book “Attachment devices of Insect cuticle” [‎5] (see Appendix 1). The paper gives an overview of the functional design of attachment devices occurring in insects and how nature’s design may be used as a basis for biomimetics in various technological areas. In particular he advocates nature’s use of surface patterns that form friction-based probabilistic fasteners that “provide precise reversible coupling surfaces with a minimum expenditure of force”. 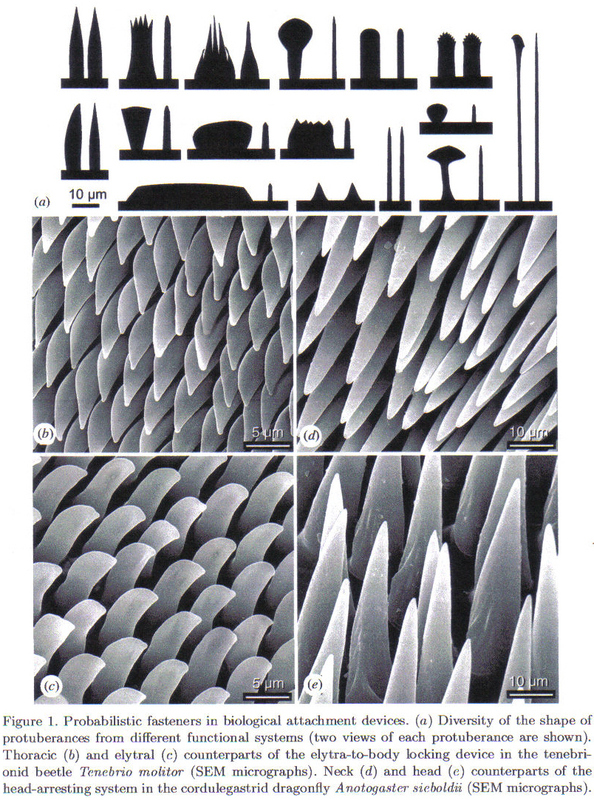 For prototyping micro-scale surface patterns the engineering approach is to use low viscosity wax to produce surface casts and copy the surface profiles using existing techniques. But first it requires a biologist’s knowledge of systems and a material scientist’s techniques to measure their properties. “An engineering approach is to copy the surface profile using available techniques”. In nature, studying with a reverse engineering analysis, it is recognized that different combinations of these can exist in any one attachment mechanism. In all systems friction is required to overcome friction. Optimization consists of minimizing friction at one end of the system while maximizing it at the other, for instance low friction in joints but high friction between surfaces and contact with the limbs in locomotion. 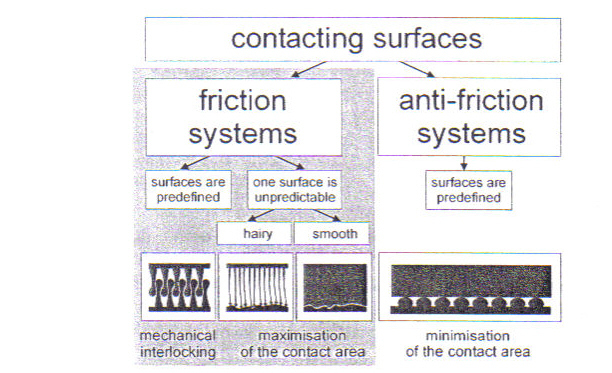 Anti-friction surfaces are always pre-defined pairs of surfaces. Such systems have merit for study in the field of tribology, that is, the study of friction, wear and lubrication. Friction surfaces may deal with predefined surfaces known as probabilistic fasteners such as wing-locking devices or head-arresting systems. Alternatively, a friction system may have one surface which is unpredictable such as between the feet of and organism and the variety of surfaces that exist. Insect attachment pads are represented by two designs, hairy and smooth. These two types of friction devices represent two main working principles of frictional devices; mechanical interlocking and maximization of surface area. Figure 14 shows the nature of the study of attachment mechanisms. For application to MEM technology, Gorb says that nature is full of micro-scale surface patterns which have yet to be studied. Continental® tyres is cited as a biomimetic example since it has developed a “honey-comb” tread. When considering designing from natural systems, the paper suggest that the material currently most appropriate for mimicking the range of properties of biomaterials is polyurethane foam because local foaming presents an opportunity for varying material properties in the same piece of material. It says that this suggests that polyurethane foams can be used to mimic biological attachment devices with visco-elastic properties. With reference to Figure 15 above, it shows different patterns that can be copied by taking simple casts. A two-part silicon wax is poured over the surface and an impression is taken. This impression can then be filled with “Spurr’s resin” or another low viscosity resin which becomes relatively stiff and can be removed from the negative without damage. This is an important comment. It would appear that there are other possibilities for imaging and studying the relationship between insect tarsi and leaf surfaces and this is discussed in Experiment 3 in the main body of the report. These papers have been read by the author. Some of them are still on order. This paper is based upon [‎4], “Miniature Attachment Systems: Exploring Biological Design Principles” S N Gorb, Design and Nature, 2002, following a design path described there from the biologist’s identification of the structure to the material scientist’s assessment of properties of the materials and the properties of the mechanism, and then onwards to the mathematical modeling of the behaviour. Gorb asserts in the previous paper [‎4] that as one considers smaller and smaller attachment mechanisms, hooks disappear from the mechanisms and it is parabolic fasteners that become the structures that form the mechanical interlock. This paper deals only with such parabolic fasteners. There is description of the fastener structures with regards to the properties and structures of insect cuticle. The attachment mechanism is then modeled mathematically and subjected to mechanical testing using a plastic imitation produced from resin moulds. There is a final discussion of the relative merits of hook-and-loop fasteners such as Velcro to parabolic probabilistic fasteners. The paper defines probabilistic fasteners as having surfaces with outgrowths that do not correspond exactly to each other and the interlocking takes place without precise positioning of both surfaces. 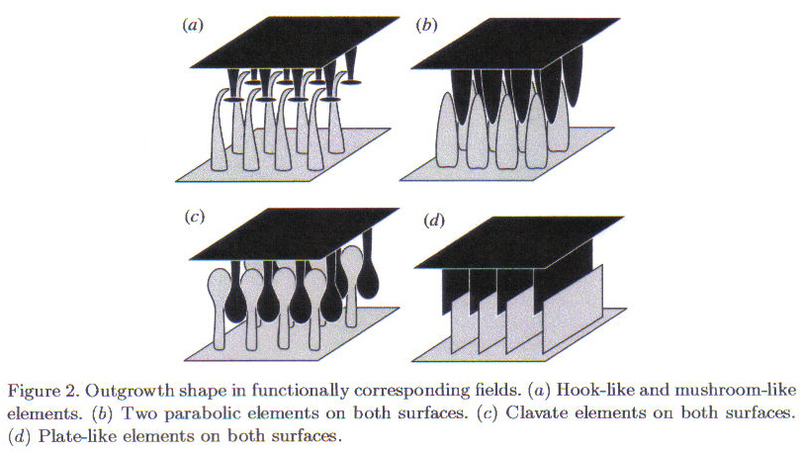 Probabilistic fasteners, it says, demonstrate high frictional forces when the surfaces come into contact. Attachment is based on the use of the surface profile and the mechanical properties of the materials, and is fast, precise and reversible. The paper says that these types of attachment occur mostly in arthropods, such as head arresting mechanisms in dragonflies (discussed in the next paper) and the elements that lock the elytra of beetles together. Hymenoptera (wasps, bees, ants), Heteroptera (bugs), Coleoptera (beetles), Dermaptera (earwigs), Diptera (flies) and some Lepidoptera that have developed a mechanism for attaching their wings to their bodies when at rest. There are co-opted fields of cuticular outgrowths present on two separate parts of the body. They differ in shape, density and directionality (see Appendix 1). For wing fixation when not in flight, the beetle wing locking system contains five surfaces covered by outgrowths and eight on the wings. The location of the surfaces and the directionality of the outgrowths prevents movement of the wings in different directions. 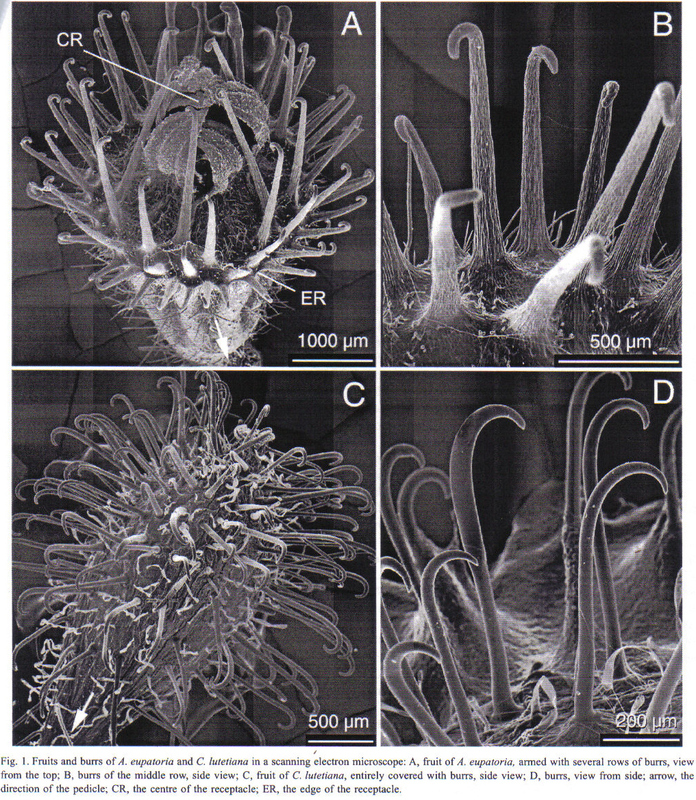 Figure 19 – The left column of images is the correspondinng protruberances of the elytra of a tenebrionid beetle. 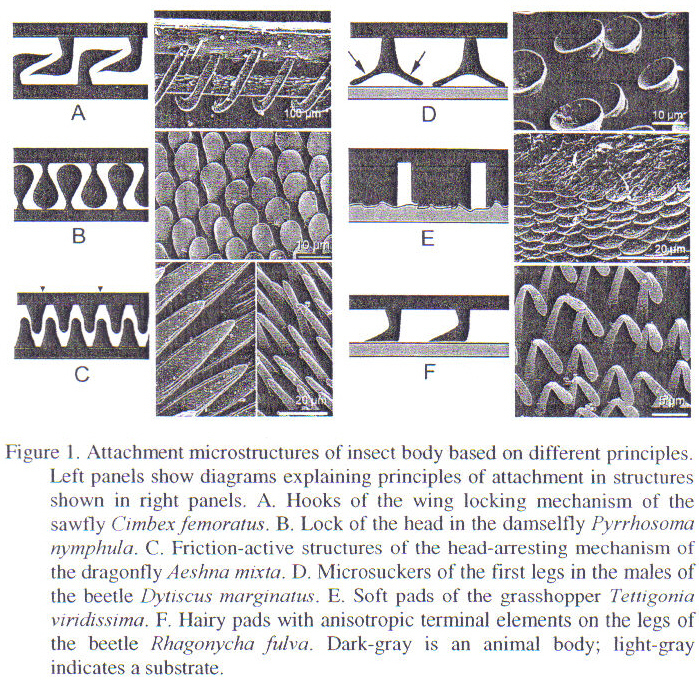 The right column of images is the opposing protruberances of the dragonfly head arrestiting mechanism from Gorb et al . Note that single elements of this structure are 0.5 – 50 micrometers in length. The head arrestor mechanism of the dragonfly immobilizes the head during feeding or when the dragonfly is in tandem flight. The fields of outgrowths are on the rear surfaces of the head and neck. Figure 20 shows different types of modified outgrowths that have been identified in functionally corresponding fields. Because of the nature and size of the biological structures, an artificial plastic model was used. It consists of two surfaces covered by process of different lengths and size. The study was undertaken to combine experimental data of force measurements, obtained on a large scale model system, and theoretical considerations based on the simple model of behaviour of probabilistic fasteners with parabolic elements. Figure 19 with different geometric proportions and different materials with different frictional properties to see how they would affect the loading-attachment behaviour of the system (see Figure 21). The elements were tested in a dry state and when wet with water and then oil. The load force was defined as the force to push the surfaces together and the attachment force as the force to separate them. Figure 22 shows the geometry of the teeth. 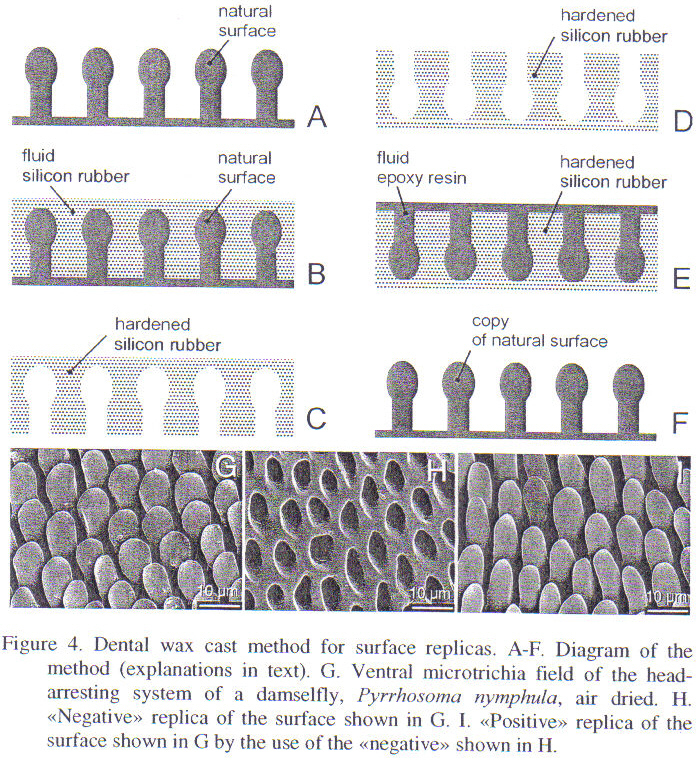 The profile was modeled as a simple quadratic and later, the elastic deformation of the plastic teeth in a horizontal direction due to the interaction is modeled as linear (see Figure 23, where Fel is the lateral deforming force). The dimension D is the distance between the two teeth at the point of interaction. The mathematical model presented in the paper is repeated here as Figure 22 and Figure 23, for reference with only some additional explanatory comments added. From Figure 22, using ordinary Cartesian Co-ordinates and from the simple geometries of the system, the following is derived. R1 and R2 are the tip radii for the lower and upper element respectively. 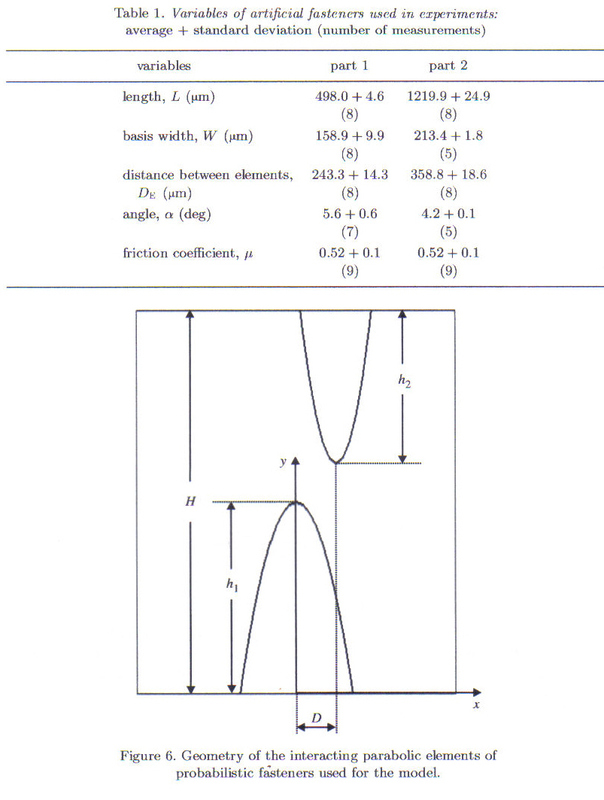 The paper proceeds with the analysis, producing an expression for the attachment and detachment forces in terms of the loading force applied by the load cell, the friction coefficient m and the angle of contact q. Consider the left diagram of Figure 23. In equilibrium conditions the sum of the forces in the horizontal and vertical directions is zero. Where FA is the maximum adhesion force (or detachment force). There is a further relation, the interrelation between loading and detachment forces. Normal and frictional forces will be different during the compression and detachment phases but the geometries (including q) and Fel (the force related to the elastic deformation of the teeth) will be the same. 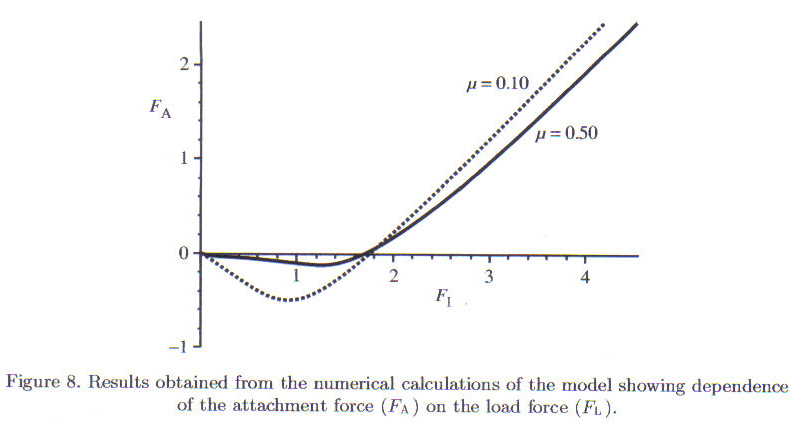 The paper continues with a calculation for the relationship between the attachment force and the load force. This case applies for a case of ideal, cone-shaped teeth. For parabolic teeth, the angle q depends on the applied compressive force and the equation (26) determines implicitly the dependence of the detachment force on the applied compressive force. This equation determines the dependence of tanq on the applied force FL. The characteristic scale of the attachment force is gR0. This paper needs to be regarded as illustrating a design methodology for extracting biological information, modeling and testing. There is always a critical compressive force required to interlock frictional fasteners. After overcoming this critical value the attachment force increases with loading force. The attachment force is of the same order of magnitude as the elastic force needed to deflect the fastener elastically in the horizontal direction by a distance equal to the diameter of the teeth tip. The dependence of the loading force on the detachment force is sensitive to the form of the teeth. The model does not take into account teeth density. It is asserted that in biological systems, the longer and wider the teeth, the less densely they are distributed. Further, in biological systems the larger the body mass the lower the density of teeth. It is suggested that a study that investigates the relationship between tooth density, absolute size and periodicity of teeth of both contacting sheets would be of interest. Dual-lock which has both surfaces covered in mushroom shaped structures. These two fasteners have an on/off functionality. They have to be able to be engaged by a critical force depending on the geometry of the outgrowths, mechanical and frictional properties of the material and the load forces generated by the material. They have to be detached by muscular force quickly. They have to withstand external forces from disrupting the attachment. It provides more structural possibilities for tuning of the load-attachment relationship. The attachment force can be scaled easily and precisely according to the loading force. The system is less noisy. Fabrication of surfaces at the microscopic scale is possible (useful for MEMS applications). 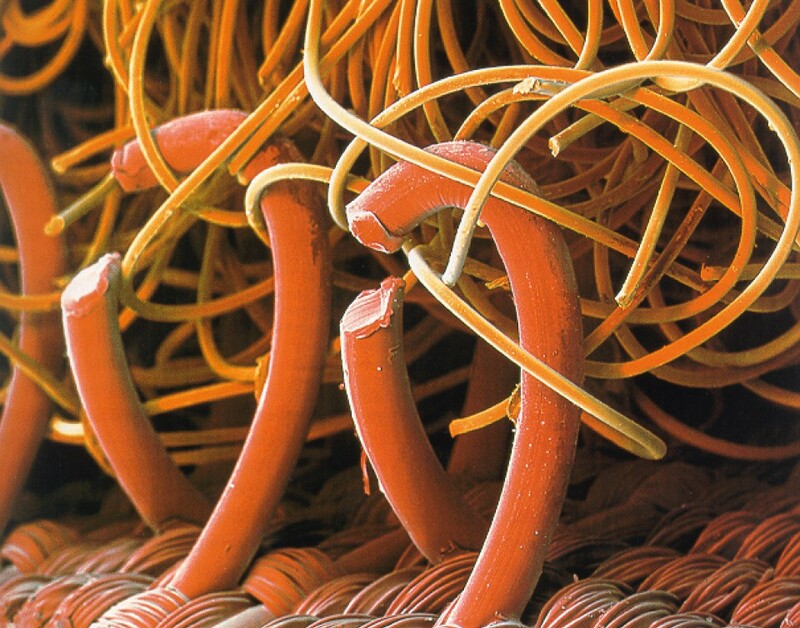 Multiple attachment-detachment performance does not destroy surfaces as fast as Velcro. These papers have not been read by the author as of yet. Some are on order. This fixation system (the paper says) of the head of the adult Odonata is unique amongst arthropods. It involves the organs of two body segments, the head and the neck. 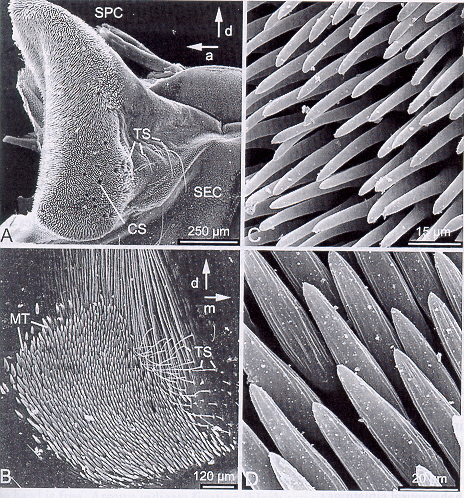 The parts comprise formations of complicated microstructures – fields of micro-trichia on the rear surface of the head and post-cervical sclerites of the neck. The skeleton-muscular apparatus sets the arrester parts in motion. The paper concentrates on structural evolution. A total of 227 species from 26 odonate families were studied by Gorb using scanning electron microscopy. 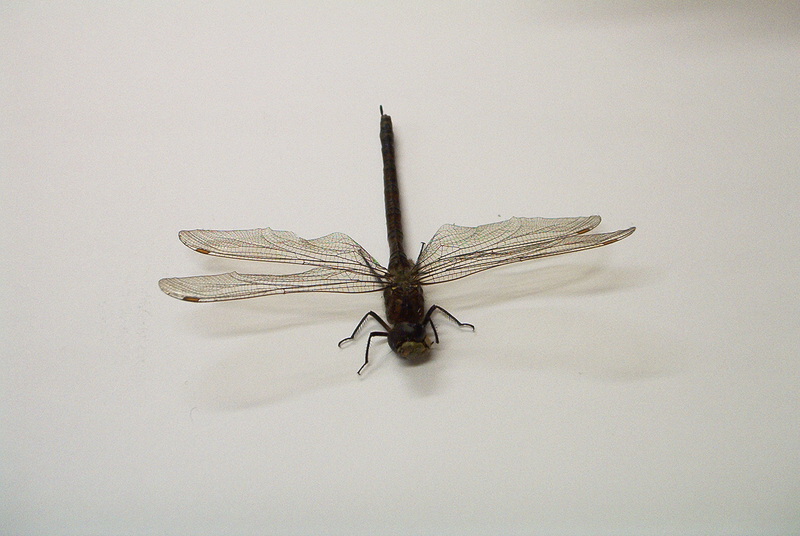 It is suggested that the reason for this action in a dragonfly is because the neck of the dragonfly alone is not sufficiently strong to support the stresses of its activities, particularly eating in flight. The added support derived from the arrestor-mechanism is required as the dragonfly tears at the flesh of its prey. The dragonfly head-arrestor mechanism is a probablistic fastener and during its normal cycle of activities (flying, eating, mating etc) it will detach and re-attach its head to its thorax in a manner that changes the head-thorax mechanism from weak to reinforced. 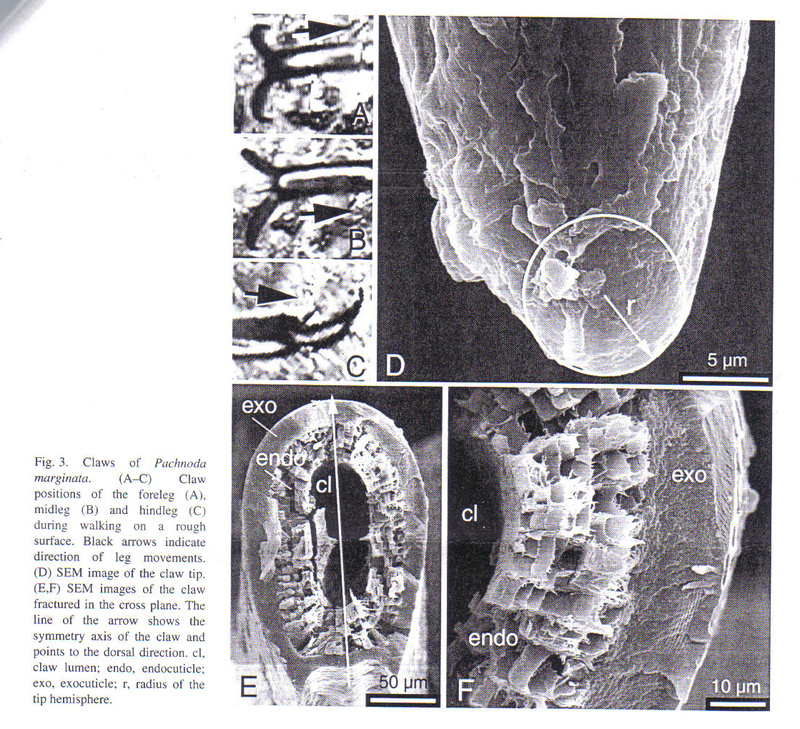 In his paper on the examination of this mechanism Gorb describes “the microtrichia-covered surfaces providing fixation due to high friction between the interlocking microstructures in the contact area” He also discusses this mechanism in his text “Attachment devices of insect cuticle” [‎5]. 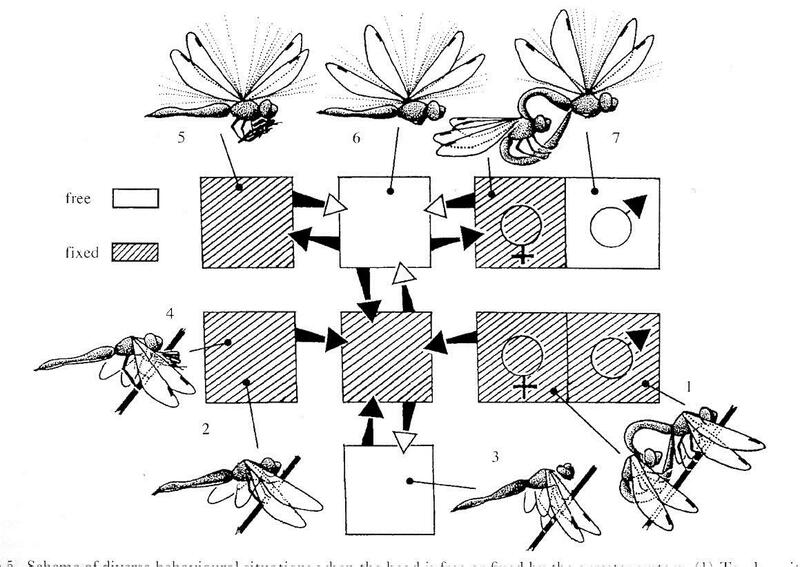 The figure from Gorb’s paper shows the different states of the attachment mechanism at different phases of the dragonfly’s activities. In the figure the hatched blocks indicate when the attachment mechanism is engaged, the white blocks when it is disengaged. It can be seen that it is engaged when the dragonfly is eating, at rest and during mating. It is disengaged in normal flight and at rest but engages prior to take off and again while landing. One can follow the pattern of arrows through the diagram to follow the progress of attachment and detachment during its activities. 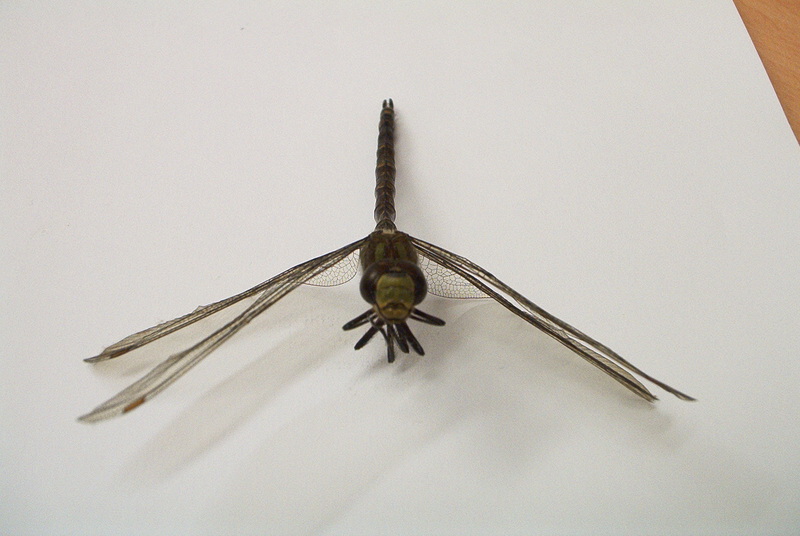 So, the head-arresting mechanism of the dragonfly is a multi-use, low strength friction joint of a field of structures. 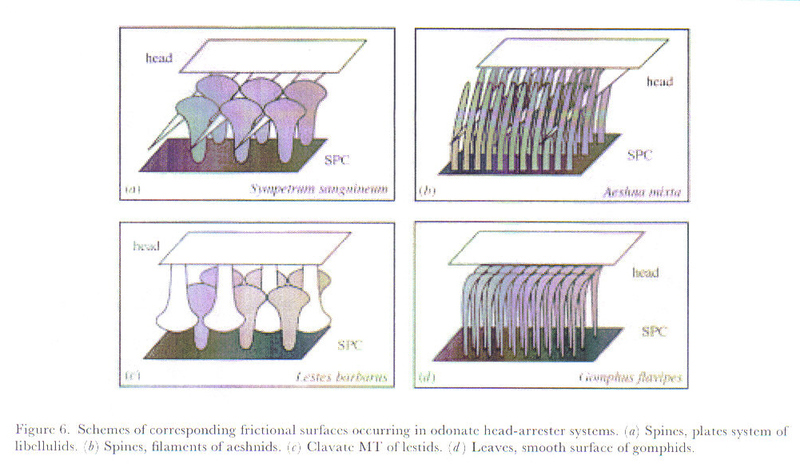 Figure 27 – Schemes of corresponding frictional surfaces occurring in odonate head-arrester mechanisms from Gorb [‎8] shows some of the configurations found by Gorb. For the purposes of illustration two images have been included below of two dragonfly specimens of the species Southern Hawker (Aeshna cyanea), collected in June 2003. Figure 28 shows a specimen that was anaesthetised in a plastic container. In its struggle before succumbing to the ether fumes, the dragonfly continued flying, trying to escape. Hence it seems at death its head was in the free-flight or detached position, resulting in the specimen having its head loose and sideways. (see red arrow in the figure). If one looks closely one can see that the head is tilted sideways to the longitudinal axis of the body. In comparison the second specimen was found dead on the stem of a vine two weeks later (see Figure 29 below). This specimen died naturally in a perched position with its head-arresting mechanism engaged as indicated by its strangely composed, prayer-like posture and with its head symmetrical about the longitudinal axis of the body. Gorb count hair density, length and thickness to be of importance to the effectiveness of the attachment. It is suggested that material qualities such as surface texture also contribute significantly, reflected in the frictional characteristics. This paper is included here as a background paper to research into biological systems for the purposes of engineering innovation. It makes use of a Russian design algorithm called TRIZ which, researchers say, identifies a “systematic means of transferring knowledge between different scientific and engineering disciplines”. The contents of this paper have been addressed here with reference to biological attachment mechanisms to demonstrate how attachment mechanisms can fit into the TRIZ framework. TRIZ makes great use of the term ideality and descriptions of what makes a solution ideal. It is concluded that the use of an external system of any kind is not ideal and that ultimately “the system should evolve to be self-serving or self-actuating”. The TRIZ database itself provides an objective framework for accessing solutions from other technologies and sciences by using functionality as the key. 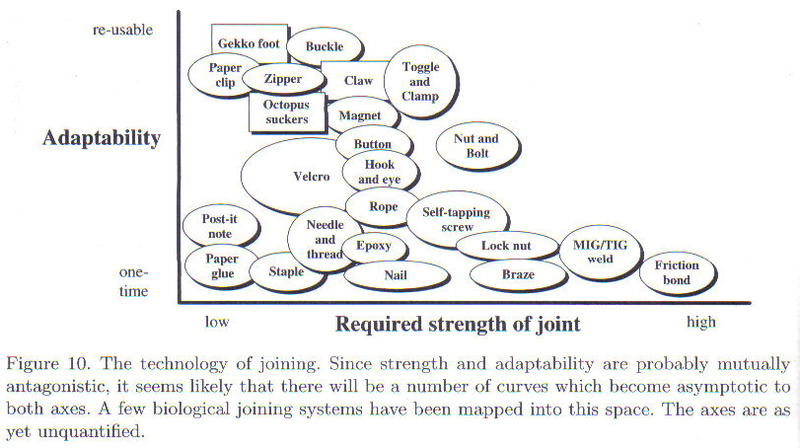 Refer to Figure 30 – The technology of joining – note that biological attachment mechanisms fit into the areas distinguished by relatively high adaptability and low strength where some biological fasteners, including Velcro, gecko feet and octopus suckers, have been placed into the design space of all fasteners. It should be noted that the space denoted “friction bond” refers to a form of permanent welding using friction, commonly used for welding/joining plastics. The attachment mechanisms researched in the preceding papers, particularly those of parabolic structures, have not yet been classified and included into this chart. With reference to Sections ‎4.2 and ‎6.1 previously, it can be suggested that these fasteners would share a space with gecko feet, being of high adaptability and relatively low strength. TRIZ illustrates technological progress through a series of formulae that are supposed to demonstrate a pattern of thinking and/or evolution and also to map a direction in which inventive solutions arise. 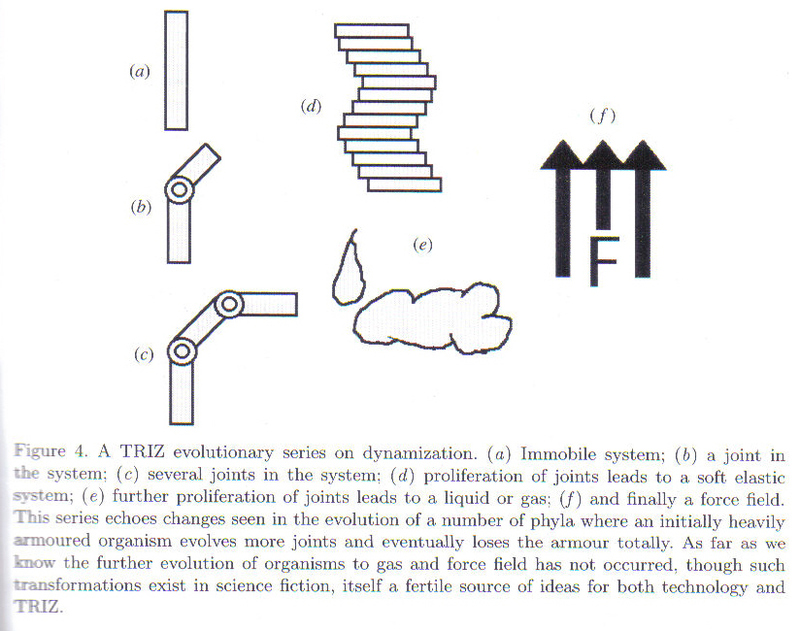 In particular with reference to attachment mechanisms, Figure 31 – TRIZ series for jointed parts below shows the evolutionary series. In considering the meaning of the word “field” with reference to attachment mechanisms in a general form, TRIZ infers that an inventive solution of ideality would be one that integrates the use of fields from within the system. There are to obvious solutions arising from this. The first is the use of a field of structures as per probabilistic fasteners, friction-based, re-usable and none specifically aligned to increase the opportunity for attachment. The second approach suggests that using a field in attachment mechanisms could indicate internal stress fields, in other words a self-actuating attachment mechanism of a material that was able to change shape in a controlled manner. 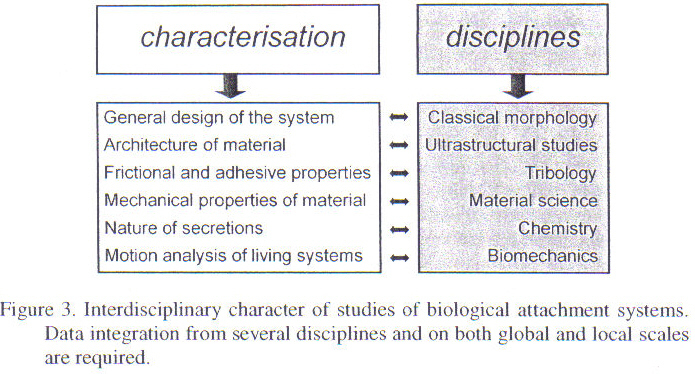 This clearly shows where, with reference to Gorb’s work on Miniature Attachment Systems (Section ‎4), the material scientists steps in to both analyse the biological material and to work upon analogues in other materials such as shape memory materials and polymers to reproduce the desired qualities. These papers have not bee read by the author as of yet. Some are on order. This paper describes how the tarsi of these beetles have adapted to use on different surfaces. 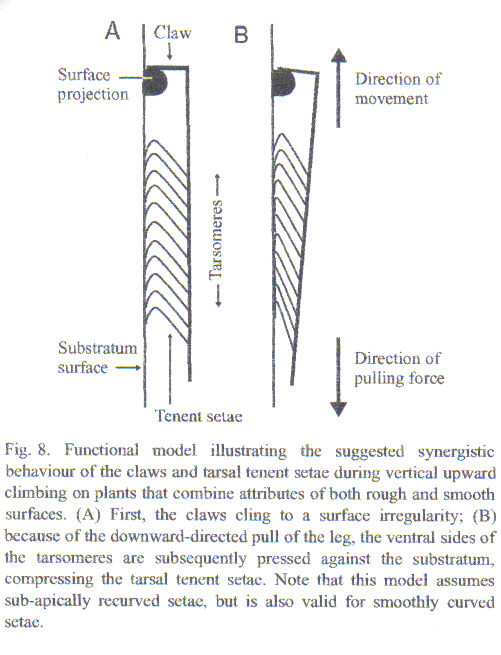 The tarsal claws have tenent setae or hairs on their underside which, it is suggested, act with the hooking action of the claws to aid attachment to surfaces in a functional synergism. Closely related species of this genus can walk upon the surface of water and climb vertical plant surfaces. There is an observed difference in the morphologies of related species in that those that can only walk upon water surfaces but not climb vertical surfaces have narrower claws than those that can climb vertical surfaces. That widened tarsi allow better support on the water surface. Each beetle had a stiff hair glued to the surface of the pronotum (the anterior or upper surface of the beetle). They were then weighed because the experimental procedure includes placing the entire beetle upon a microbalance and then measuring the change in reading. The hair was used to fix the beetle to a mount such that the beetle was in a vertical position without contact to any surfaces. Four surfaces of different roughness values (Ra) were brought into contact with the legs of the beetle. The surface roughness was determined using an optical profiler (Veeco Instruments Inc., type NT3300) run in the VSI mode and calibrated according to an NIST-certified step height standard (10.10 mm step height). It is said that as soon as the surfaces were brought into contact with the legs, the beetles began trying to climb, producing a reading on the micrometer. If the beetles didn’t respond they were brushed with a light brush to stimulate “escape” behaviour. Tests were conducted on the beetles with claws and setae intact, with the setae contribution suppressed by coating and fixing them with superglue and with amputated claws. Each beetle was filmed walking on the surface of a small basin of water. Since the mechanical principles associated with this form of attachment include surface tension and not the mechanical interaction of structures, the aspects of this paper associated with this part of the experiment are not included here. It is sufficient to include that the paper describes an assessment of the wettability of the tarsi and the surface tension of typical pond water. 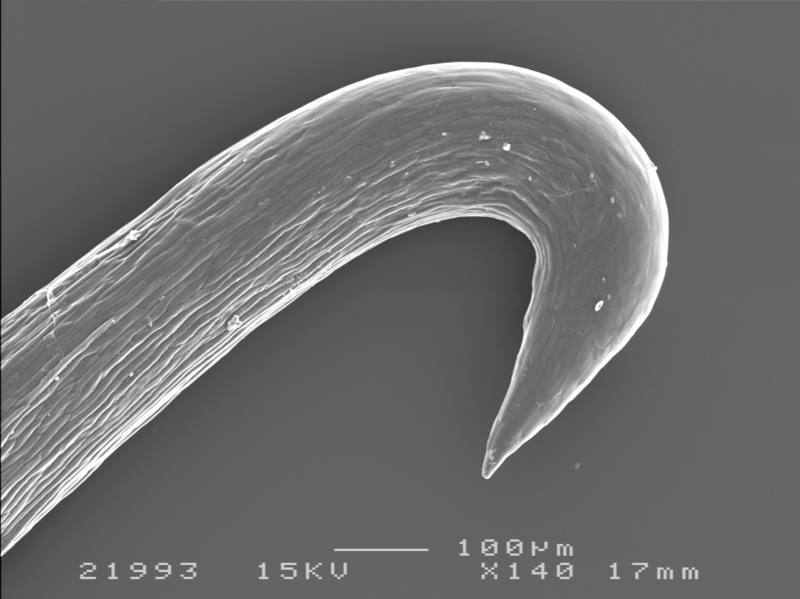 The number of setae per tarsus was obtained from a previous paper on the species. It was found that species with wide tarsi on average exhibited significantly higher forces than species with slender tarsi. This clear distinction between the two groups was observed only on glass and photographic paper, i.e. the smoothest surfaces. Therefore the importance of the number of ventral tarsal tenent setae for the attained pulling forces is greatest on glass and decreases in the order of increasing surface roughness. Tests were made on the leaves of Phragmites communis and Glyceria maxima, both fresh and dried. The experimental results of the study demonstrate the importance of wide tarsi, accommodating a large number of tarsal setae, for climbing on vertical plant surfaces. On rough surfaces the maximally attainable pulling forces should be limited only by (i) the leverage and maximum power output of the leg muscles and (ii) the yielding strength of the pretarsus and the surface projections of the substratum. It is suggested that the shape of the claws in relation to the surface roughness may have a special significance but this is not investigated further. There is also mention of the tarsal secretion of insects, sandwiched between the ventral tarsal surface and the substratum, considered to be a vital component of attachment in both hairy and smooth systems. The underlying attachment forces acting parallel to the substratum are generally considered to be a combination of capillary, viscous, friction and molecular forces. Natural plant surfaces usually combine the surface characteristics of both rough and smooth substrata. The smooth plant epidermis might be disrupted by cuticular folds, leaf veins, trichomes or wax crystalloids (see Appendix 3). Because wax can contribute towards reducing traction by exfoliating and clogging the setae it is thought that the structure of a single setae is of less importance. Consider Figure 32 – A mechanical analogue of of tarsul and setae on leaf surface from Betz [‎10] and note how, during the pulling action, the metatarsal rotates about the fulcrum of the surface irregularity. This has the effect of pressing the setae to the plant surface which increases both the surface area and the reaction force from the surface and therefore the adhesive and frictional forces respectively due to the setae. This paper examines the force relationships between the tarsal claw of a single species of beetle and surfaces of varying surface roughness. It adopts a mechanistic approach, examining the structure of the claw and the dimensions of the claw tip as well as the surface roughness Ra and examines their interactions. It considers the attachment force to have two component forces, namely interlocking and friction. This paper studies the attachment forces generated by claws in a “free walking” beetle, emphasizing the relationship the relationship between the dimension of the claw tip and the substrate texture. The species Pachnoda marginata was selected for experimentation because it does not possess any specialized attachment devices for smooth substrata. 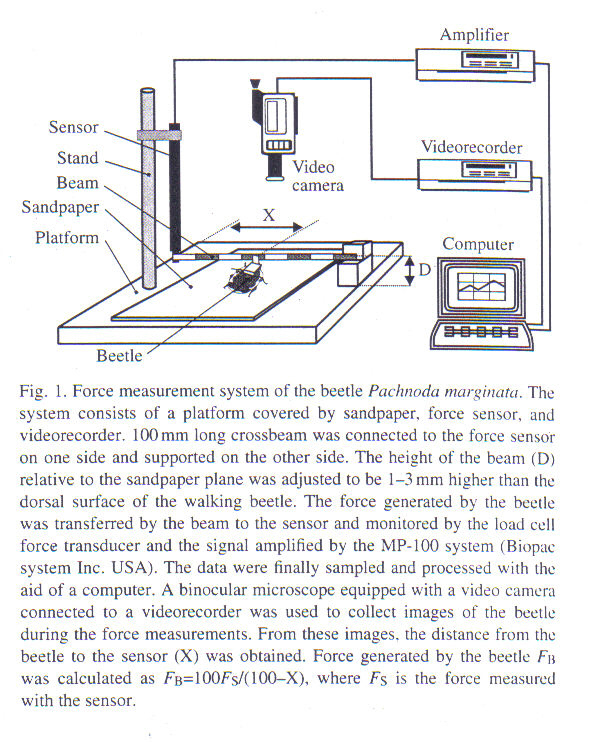 See Figure 33 – Measuring the thrust of a beetle from Dai et al [‎11] and note the comments included from the original paper. The forces generated by a moving beetle were measured to assess the force range with which the tarsal claw interacts with the substrate. The mechanical properties were then evaluated by testing the individual claws in a fracture test. Then the internal structure was studied using a scanning electron microscope after being air-dried for 4 weeks and sputter-coated with gold-palladium (10nm). The claw material was studied using a freshly fixed, dehydrated and critical-point dried claw. Sandpaper of six different roughnesses was used, the surface profile being measured using the perthometer M1 (manufacturer Mahr GmbH, Dusseldorf, Germany). Ra was defined as the square root value of the difference between heights to its average height. Figure 34 – Claw Goemetry shows the method used to describe the shape of the claw. The claw is described using a set of radii. Five arcs are used to describe the curves. 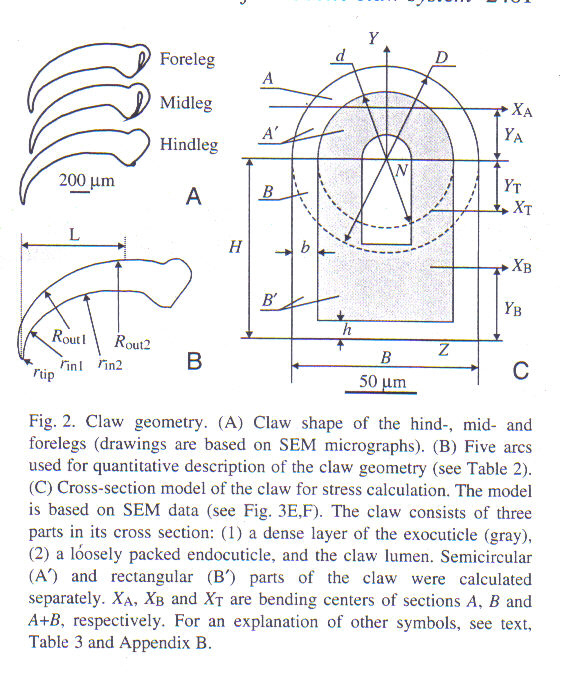 Drawing “C” shows how the claw was split up into component shapes for stress calculations. The internal structure of the claw is shown in Figure 35 – SEMs of the claw interior structure below. 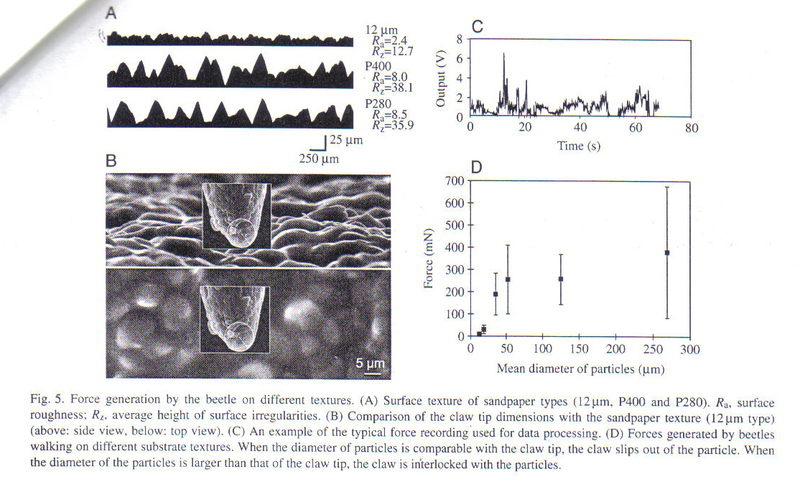 Figure 36 below shows the force measurements of the claw over the various surfaces. Figure 37 below show the idealized geometry used to calculate the interactions between claw tip and a surface irregularity. 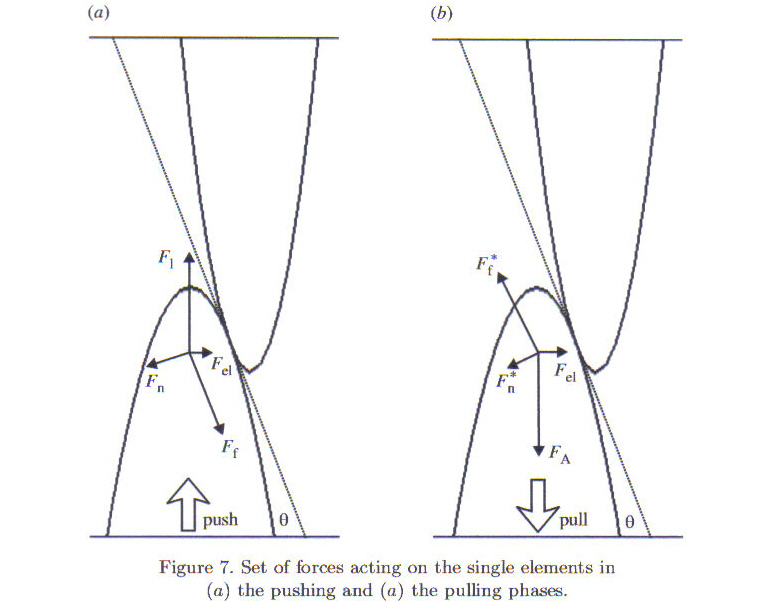 Figure 38 below show the idealized geometry used to calculate the interactions between claw tip and a surface irregularity. ‎2 to ‎6 contain a review of papers from S N Gorb et al concerning the study of hooked and parabolic fasteners and the development of and design methodology for biological fasteners. 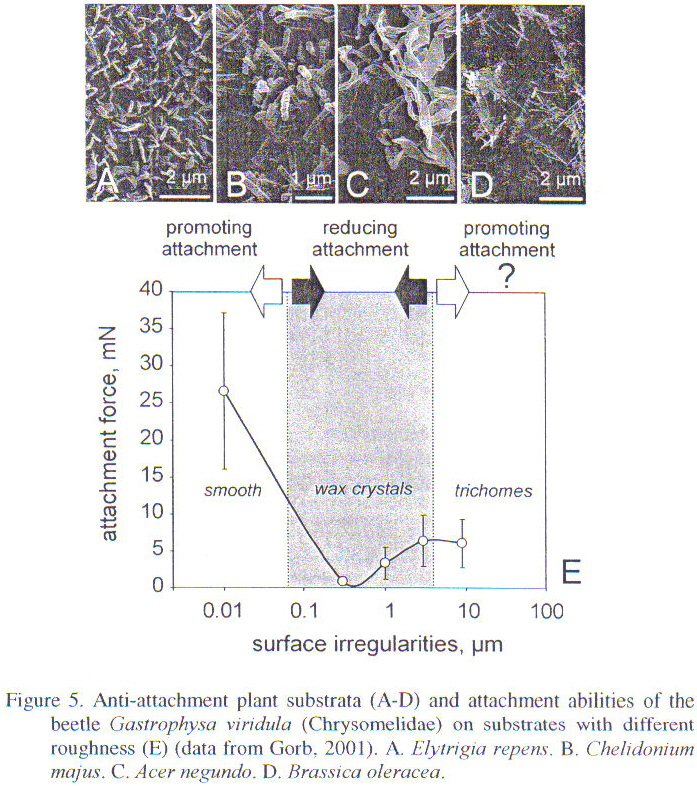 Sections ‎8‎9 describe studies of insect tarsi performance and insect tarsi/surface interaction and their parameters. These papers have been read by the author as of yet. Some of them are on order.